Philem Rohan Singh, who aspires to pursue Masters in English from Jawaharlal Nehru University, will be cycling about 2,500 km from India Gate in Delhi to Imphal, covering 100 km a day. 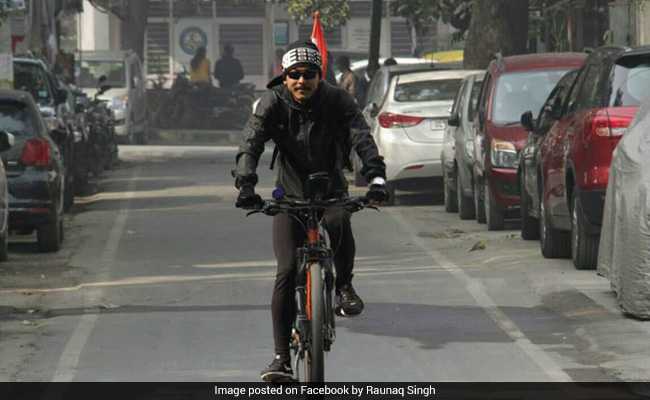 New Delhi: Seeking to raise awareness for a pollution-free India, a Manipuri cyclist today embarked on a tour from the national capital to his home state. Philem Rohan Singh, from Moirang in Manipur, will be cycling about 2,500 km from India Gate in the capital to Imphal in what he called "a journey taken with extra mile". "I was planning to do something like this since I was a child. I wanted to do something special and uniquely different from others," Mr Singh told PTI. With Delhi's air quality index oscillating between poor and very poor, he decided to club his love for adventure sports with a cause. "I have been living in Delhi for the past 6-7 months. I constantly read reports of Delhi pollution being high. I was already planning to take this journey. The day after Diwali, because of the pollution, someone suggested I should club the two things," Mr Singh said. Philem Rohan Singh, who aspires to pursue Masters in English from Jawaharlal Nehru University, will be cycling 100 km a day. "I have been into bike riding for the past 2-3 years. The maximum I have gone is 500-600km per journey. I have never done anything like this before, I hope I am able to raise awareness for the cause," he said. Pollution was a major concern in the capital and neighbouring cities in the latter half of 2017 with toxic smog disrupting normal life. The smog in Delhi also cast a shadow on several sporting events as well, the most prominent being the Sri Lankan cricket team wearing N95 anti-pollution masks during a Test match against India here.